Last fall, we said the rally in PMs would take longer than most expected. Expectations were unmet in 2013, and it is possible that 2014 may be no different… gold gives no indication of beginning a strong rally that will change the trend, any time soon and, while the next sustained bull market may well favor silver outperforming gold, silver may have to go lower before it can go higher. Let me explain why this is the case. 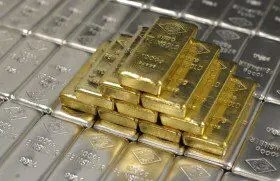 So says Michael Noonan (edgetraderplus.com) in edited excerpts from his original article* entitled Gold And Silver – NWO “Problem-Reaction” Ploy Stronger Than Fundamentals. Gold is well under a 50% retracement between the last swing high and low. This is just a general guide to indicate the strength or weakness of a market. The farther away price is under the half-way area, the weaker the market. More of an issue is the bearish spacing. Whenever there is a space between the last swing low and the next swing high that fails to close that space, it indicates that sellers are more aggressively in control. Based on the weekly chart, gold gives no indication of beginning a strong rally that will change the trend, any time soon. The trend is always treated with respect as the most important first piece of information because it captures the prevailing price momentum. The best way to trade successfully is in harmony with the trend. Regardless of whatever information that portrays the reality of dwindling supply for gold, the reality of the charts takes preference because the charts are more driven as to timing, and now is not the time to be long futures, just yet. The reading of charts is always in opposition to the ongoing purchase of the physical metal. Given the circumstances driven by central bankers, at some point, reality will rear itself onto center stage, and the physical will outperform almost every other asset class, and just as importantly, availability may not exist. Keep on buying the physical. The charts keep the paper market in context. At some point, the price expectation that actually reflects true supply and demand will align, but now is not that time. For as long as the trend remains down and price is well under a 50% retracement, the market is weak. There has been a series of overlapping bars as seen in the box. Overlapping bars indicate a struggle between buys and sellers for control. There is a temporary balance, and it will eventually lead to an imbalance as price next moves directionally. The lack of downside follow-through, after the highest volume bar 7 TDs ago, has been an anchor for the current rally, of sorts. The caveat as to which way price will move from here is the trend, which favors lower price behavior until there is an indication of change. Right now, such an indication is absent. Of minor concern is the location of the closes for the 3 bars at the end, tending toward the lower range of each bar. The offset is the fact that despite apparent weakness, price did not move lower. If gold trades higher next week, the daily trend will turn up, and confirmation will come from a lower swing high on the next correction. The same applies to the buying and accumulation of physical silver. Based on the ratio for gold/silver [which is] strongly in gold’s favor, the next sustained bull market may well favor silver outperforming gold. We strongly advocate the buying of physical silver. The silver chart below is similar to gold but more compact, and weaker, in general. Comments on the chart explain our view of that developing market. Silver has been “looking” like it could be forming a bottom, but the…price is, so far, not showing any ability to rally, and the continual hugging of this low area may mean that there is insufficient demand. In order to find demand, silver may have to go lower before it can go higher. We will just have to wait until supply and demand are resolved. 3. Noonan on Silver: Wait for Price to Confirm Its Intent – Then Start Stacking! 4. Noonan: The Trend in Gold Remains Down – But For How Long? Nothing is certain and that especially applies to the value of BOTH stocks and PM’s. We have seen over and over again that the Central Banks and/or Wall Street surprises all of us by puling yet another fast one (aka a trick, like pulling a rabbit out of their hat) that convinces almost everyone that things are not as bad as they really are. If they are successful, and giving them their due, based on their recent tract record, I believe that in May we will see a moderate “adjustment” or some other fancy word applied to the reduction in value of many stocks while the increases in value of PM’s will be referred to as “a slight temporary gain in solvency” or other some such pooh-poohing to discourage investors from looking to hard to see what is now happen behind the “RED” curtain. Yes, I agree that the PM market is being manipulated by the Central Banks and their close friends the Big Banks; sooner or later all the things they are juggling to keep the lid on this can of fiscal worms is going to end and then we will se PM’s suddenly restored to there rightful value as everyone scrambles to “fill” the paper trades, which will cause the values of PM’s to skyrocket! A good example of what may happen very soon is what happened to VW stock when investors were using naked shorts to drive VW stock downward. Then suddenly there was none to be had, (since VW was quietly buying up as much of it as they could get on the quiet) and those not holding physical shares had to pay what was then enormous amounts to settle their accounts, which made VW stock very valuable!